*A binder - I get the sturdiest 2 - 3" money can buy, Heavy Duty with a clear plastic insert front. Each of my kids have a different color. *A nylon binder pencil case. * Plastic sheet protectors. I buy them by the gross from Costco. 1. Assemble all of your pages. From back to front insert plenty of plastic sheets, binder folder, then the pencil case. 2. Assemble your medical docs in chronological order. If it's an important two-sided page, you can put one page in the clear plastic. But if it's not, I do two faces of documents per page so I can see the pertinent info. If it's a packet, like, "What to do when you're TWO! ", I just stick the whole thing in one page protector. You can try and do sections, but Dr.s usually ask questions that start with "When was the last time you..."
3. Immunization card and pens go in the pencil case. [ Note: When getting shots for kids I have the nurse fill out the information FIRST and give the shot SECOND so that I can take my wailing kid out post haste. If Matthew is there with me (...it happened with the first two kids), I'll send him out to make the next appointment while the nurse is filling out the Immunization card.] Slick as snot. 4. Put the oldest documents and information at the back. 5. Copy of Birth Certificate on top. 6. Picture of child on front cover with all pertinent Dr.s information taped to the picture. 7. Map of the directions to your pediatrician. This is for those who move a lot, or have a terrible memory, or have their husband take the kids to their appointments, or all of the above. 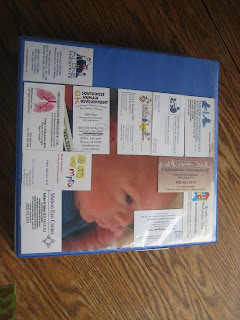 You see a picture of Benjamin's folder with the business cards of heart specialists, eye specialist, every pediatrician he's ever seen, pharmacies where Rx are sent, dentist info, nurse-on-call numbers, and school info (so you can call the school when you are doing a Drs appt). He was a preemie, and his medical record has been copied AT LEAST eight times. Now, it's a one stop shop. Since all information is on the cover, you can glance at the info you need without searching all over the place for numbers, faxes or addresses. Now, some would disagree with my method for "identity theft" information purposes, and I acknowledge their wisdom, and yet still do it my own way. I have yet to hear that, "They robbed us and took the medical binders!" So, I keep an original birth certificate in the velcro binder folder as well as the kids SS card. Usually when I need one, I also need the other. I also keep their Congratulations from the White House, and collectible stamps there as well. You could also store finger print information, locks of hair, whatever your heart desires. It's all in one place. So, there you have it! It doesn't take much time to set up if you have all of your materials ready, and it is just as easy to do all of your kids at once than to get stuff ready separately. Any time you go to the Drs office, grab the Dr.s business card and tape it RIGHT THERE to your kids pic. Okay--I just read the Overcompensating post. Let me tell you, I recently purchased the first bras I have EVER owned that fit correctly. The underwire lays flat against my sternum. There is no muffin-top anywhere. I can wear any shirt without fear of bulging or uniboob. The shape is pretty, not too pointy or too flat or to wide-set. I stay cooler. My clothes fit better. It has changed my life, and I'm not kidding! Where did I get these wonderful bras? At The Bra Patch in Raleigh (I was there for CLE), which sells "hard to fit sizes." The cup sizes are so far down the alphabet, my A-cup friends could only stare in wonder. Best of all, these bras are honest-to-goodness pretty. Pretty! I have a pretty bra! You might investigate them online at figleaves.com. The brands I got are Elomi and Goddess (!). The sizes are for my eyes only. Thanks Katrina!!! That is a lot of information and soooo helpful. I mostly toss the stack of stuff that says "your kid got x, y, and z shots and what they all mean". I figure I can find info on the D-TAP online if I need to. But we have not been frequent fliers so I am not sure I need 2-3 inchers. I have 3 hot pink binders and will add their names to the spine. I started collecting biz cards a couple months ago anticipating finally doing this. I STILL have stacks of paper and files all over my kitchen table. I refuse to move it just to do something like sitting and eating dinner as a family. We sat at the bar, kiddos at the kiddo play table and Kateroo in her high chair. So what do you do with tax returns? Do you keep the escrow/title stack o crap from the first loan on the house that we don't even have anymore? I get the "pitch the old church crud" idea - even though I was in YW 8 years ago I will still tailor all I do to THESE girls. With credit card statements we pretty much only keep 1 -2 months the rest are available online. What stuff do you scan to go digi? Come go out to ice cream with me!!! I seriously need the girl talk! I love it, love it, LOVE it! This proves we are definitely related as I am all for anything that is organization-centered. Promise me you'll show me this beauty when I come out in August so I can copy you. 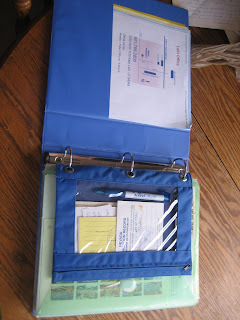 Ahhhh, medical binders and Suze Orman breifcases. Now I feel even more unorganized than I thought! I need to have you come organize my life, Katrink.